Our AGM, held in January, produced a record attendance of 35. These numbers reinforce the strong support for wildlife in the village boosted by members from Dinas Powys, Penarth, Radyr and Barry. Our visiting speaker was Peter Sampson who talked about Flat Holm island, its history and wildlife. Not only was it informative but Peter entertained us as well with tales of lighthouse keepers and the ingenious ‘goal posts’ which prevented anti-aircraft gunners on the island shooting the top of the lighthouse. For more on the island along with the opportunity to join the Flat Holm Society go to http://www. flatholmsociety.org.uk. We were also pleased to welcome Janine from Daisy Graze who has used medlars from our orchards to produce Elizabethan Medlar Jelly. These, and her other products, can be purchased from farmers markets and Janine plans to be at the next Open Farm Sunday at Goldsland which takes place on June 9th. Meantime we have been in planting mode. The Goldsland Farm Orchard now includes a Medlar, giving us 6 in total, along with a Quince, which are becoming increasingly popular but very difficult to buy in the shops. Such is the aroma from Quinces that they were once placed in clothing drawers to make garments smell nice and it is said that adding a slice or two of Quince to an apple pie raised it from the hum-drum to the exceptional. 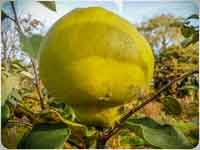 Although Quinces can take some time to mature, the variety we have planted is Meeches Prolific and the fruit can weigh as much as half a kilogram. There is often confusion between the traditional Quince which we grow (Cydonia) and the smaller fruit which grow on the quite common garden shrub, the Japanese Quince (Chaenomeles). The picture shows a Quince growing in our Community Orchard off Station Road. Two St. Cecilia apples have been planted which came top of our taste test last year and 4 varieties of cider apple that are new to us have been included, namely Cummy Norman, Breakwells Seedling, Twyn y Sherrif and Perthyre. Finally two donated Victoria Plums complete the picture. Wildflower seed will be spread in the Spring as we hope to create wood pasture, a rare habitat for Britain. It is good to see some of the bulbs, such as English native Bluebells, which we planted last year, already poking through. Visitors to Dyffryn Gardens may have noticed that their orchard planting has nearly been completed and this will be a useful addition to our Orchard Trail as it will be publicly accessible at some stage from an adjacent public footpath. The trail could then include 6 orchards with a possible extension to a seventh at Peterston.